No trip to the Bahamas can be complete while limiting yourself to just New Providence Island. Adventurers from all around the world have made this tour a favorite and even returned to make a second voyage down to this tropical beach oasis for an experience that only few get the chance to take part in. Let us take you out to two of Bahamas’ most treasured destinations for a once in a lifetime opportunity that’s unique to these islands. Our first destination is the thrilling Allen's Cay where you’ll encounter our native iguanas looking for a treat. Our crew will wrangle up some reef sharks for an exciting show! Jump right in with these majestic creatures, if you’re adventurous, and help with the feeding and get right up close for an educational moment with sharks that you never thought possible! 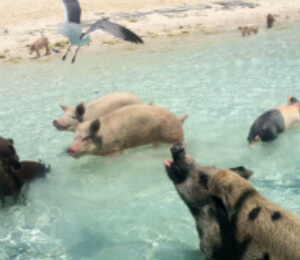 Our next destination is the famous Pig Beach where you’ll meet the swimming pigs, take in the amazing coastal scenery, and enjoy lunch at the Staniel Cay Yacht Club. Our friendly resident pigs love to see new visitors coming in, that means they’re about to make new friends and get some tasty morsels to enjoy while you become mesmerized by the manner of these happy guys. Swimming with pigs, up-close with Caribbean Reef Sharks, feeding island iguanas, enjoying a thrilling boat ride from Nassau to the Exumas, and taking in all the sights of paradise for a full day trip that will create lifelong memories and conversations for years to come! Why not schedule your trip today and experience it for yourself on the next tropical vacation? Spaces are limited to 15 per trip, don’t miss your chance. Be sure to plan and book well in advance! Q: Can this be done from a cruise ship? A: Yes, however ships must arrive at 8am or earlier and be staying overnight to ensure there are no problems with making it back in time, to the ship. This tour is not suitable for pregnant women, children under 2, persons with neck or back injuries, or ones with serious mobility issues. We require a minimum of 8 passengers to book this tour. I have been to the Bahamas many times, but Exuma And Swimming Pigs Adventure is one of my favorite trips! It includes everything that everyone should do here. As a Bahamas veteran, I can say only the best about this experience!